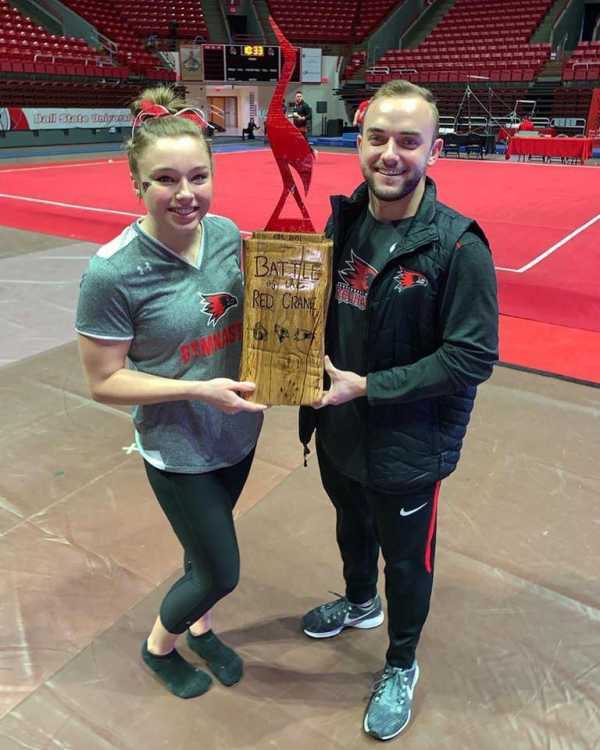 Junior gymnast Kendra Benak and assistant coach Chris Licamelli hold the trophy the two constructed for the Battle of the Red Crane. Southeast is the only school from the Ohio Valley Conference with a gymnastics program as of 2019, which makes it tough for the program to create annual rivalries for competitive meets. Junior gymnast Kendra Benak and assistant coach Chris Licameli put a plan into action at a tri-meet Feb. 24 in Muncie, Indiana, between Southeast, Illinois State and host Ball State. He saw a picture of the “Illibuck” trophy, which is contested between the University of Illinois and Ohio State University in football every year. The trophy is just a statue of a turtle, which has nothing to do with either school’s mascot. Licameli said that the plan really began to get moving back in October. He said he “almost jokingly” contacted Ball State’s assistant coach Scott Wilson about the possibility of making one for the meet. “He was, like, ‘That sounds awesome,’ and I knew this would help recruiting and it would help us reschedule this meet in the future, even if it doesn’t have to be every year,” Licameli said. 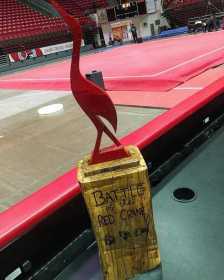 The trophy for the Battle of the Red Crane stands tall at Ball State University. Following this, Licameli purchased a red crane on the internet, and then met with Benak, who he knew was majoring in graphic design, who had previously designed T-Shirts for the team, as well as the design on the back door of the facility. “Out of all the schools in the NCAA, we’re the only schools that are red birds, or have a red mascot,” Benak said. In an attempt to be neutral amongst the three schools mascots (Redhawks, Red Birds, Cardinals), Benak and Licameli decided on a crane. From there, the work began on constructing the trophy. Licameli said the crane he purchased online arrived a lot smaller than he expected, and he decided the trophy would need a base. In December Licameli went to Benak. “I realized that I had a lot of extra (tree) stumps in my stuff leftover from our tailgating (events), and we could just use a chainsaw and shave it off,” Benak said. Licameli and Benak did the majority of the work on creating the trophy two weeks before the meet, but that did not mean that everyone was aware of what was happening. “Chris kind of wanted to make it a surprise. So he talked on the phone with the other assistant coaches, but none of the head coaches or other girls knew about it," Benak said. Heading into the meet, Kendra used a wood burner after the base was finished to put the title of the trophy and all three schools’ logos. The trophy itself became two pieces, as the crane comes off the base for traveling purposes. Despite the loss, both Benak and Licameli were proud of what it became. Licameli said Ball State plans on putting a plaque on it, that way each time the trophy is traded the new school will be engraved on there. Despite a disappointing season record-wise, it has still been a record-breaking season for the Redhawks. Southeast gymnastics had its highest home attendance record this season since the mark previously set in 1998, the first season the school had gymnastics. The average last season was 261 people a meet, compared to this season’s 631 average. As far as the atmosphere inside Houck and the Show Me Center goes, both Benak and Licameli can see the difference this season. “I know in years past around campus it’s been like, ‘What, we have a gymnastics team?’ but I feel like this year people actually know about our team and our attendance has gone up tremendously,” Benak said. Licameli credits the work of Lawson, Greek Life and the community in general for getting the attendance up this season. The Redhawks hosted a home meet at the Show Me Center for the first time in five years on March 10. However, this was just a one-time thing. Licameli thinks with enough support the team can get there on a more permanent basis. “Our [end] goal is to jam pack Houck and they have to force us to the Show Me Center,” Licameli said. The Redhawks are back in action Friday, March 22 as they take on the Centenary College Diamond Ladies at 6 p.m. in Shreveport, Louisiana.